My first introduction to shallow fried sea food hit me like a brick to the head. And that life altering experience has stuck with me ever since. I was 8 maybe 9, scrawny and spending 2 weeks with my parents in the Adriatic coastal town of Pesaro, North East Italy. On a night out with Ma ‘n Pa Kelly I was presented with Calamari Frito in a back ally dive restaurant – the sort of place only my Dad can find such is his nose for these things. Seasoned squid rings on sticks. It was the novelty factor only that led me to try them…but when I did…the planet stopped moving, time became abstract, angels sang…I had found my very own culinary heaven and I would do anything to ensure this ‘wonderment’ stayed in my life!! Simply deep frying sea food is not enough here – it has to be the right stuff, like squid, prawns, cod….. big robust flavours that can stand up to a bit of Frito! This is a speedy Gonzales of a dish – perfect for a starter or lite bite. Kick off by getting your seasoned flour ready, combine the semolina and plain flour then season with salt, pepper and garlic powder. Stick your finger in and taste it…it will give you a gauge of the seasoning for the final dish. Take all of the sea food and drop into the flour and dust well, remove and pat as much of the excess flour off – you’ll get ‘goop’ if you don’t. Get the oil into a shallow pan and bring up to a medium high temp – drop a piece of bread into the oil to check the heat, if it floats and bubble immediately then you’re good to go. Sling in the Misto in 2 batches to avoid over crowing and ending up with boiled fish! The prawns and Monkfish will take a little longer than the Squid so cook these first then finish with the Squid. Serve the Frito with a green salad and a dollopski of lemon Mayo. 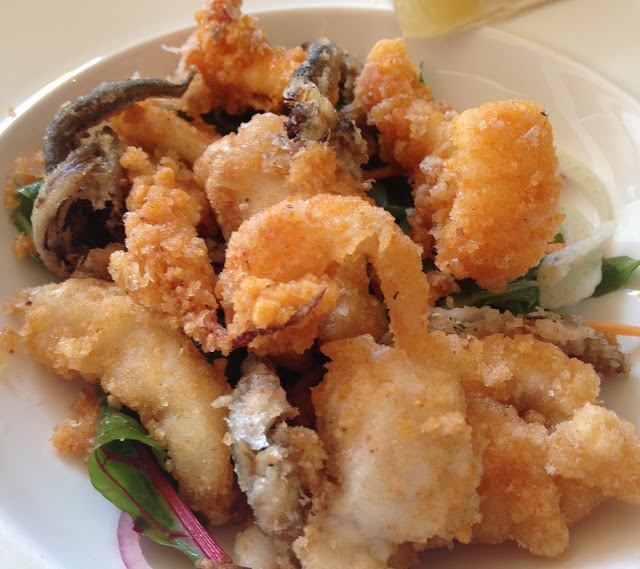 Very good looking frito misto….brings back memories of eating in good Italian restaurants. You said it!! My Sister lives in Puglia and this is run-of-the-mill!! Very hard to get it nicely done here. It looks excellent Rory. Oh my … sounds amazing! !